But, the way that such films accomplish this isn't by having the monster looking all spooky out in the open. No, it is about the atmosphere created by their being hidden. The stuff you don't know is the creepy part. And how best to keep all the truths mysteriously hidden!? 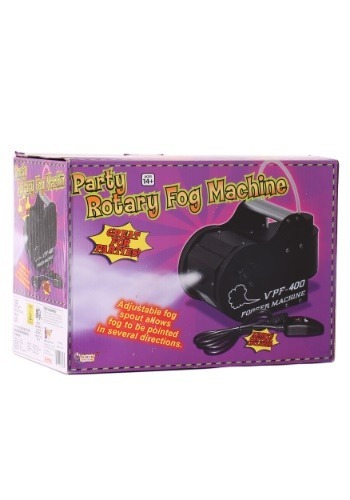 Take control of your own atmosphere by summoning a spooky fog with this Rotary Fog Machine. By using the special fog liquid and offering up a little power courtesy of a grounded outlet, your room will soon be filled with a creeping cloud. Adjust the spout to determine if you want a silent smoke along the ground or a drifting haze that falls from the walls. Whether you're calling witches, beckoning demons, hiding a slasher, or just want a little more of a mystic environment in which to play your favorite games, you can feel like a powerful conjurer with this Rotary Fog Machine giving you the perfect atmosphere for all your desires.